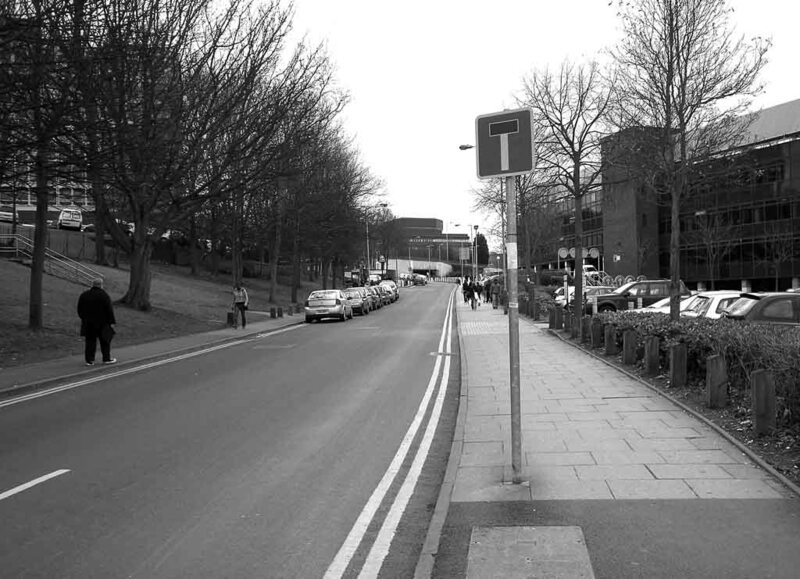 The Civic Centre today looms in the back ground above an under pass beneath the ring road while the University dominates the east side and the Molineux Stadium the west and the T sign in the foreground say’s it all. This is the new sanotized North Street all character now sucked from it. But strange ghosts still walk this street for those with eyes to see. Wellington, Gladstone, Henry Vernon, no not the famous men themselves, but apparitions of the old time managers and tenants of the noted houses whose pub signs in North Street and its continuing road celebrated these noble men. These long serving victuallers who ran their houses with an iron fist when stormy and lawless vitality was a by-word, some becoming legends in the town. One such man was Edward (Ted Adey) at the “Colonel Vernon”. 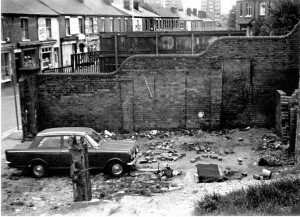 There was a gaping hole left in North Street and in the community itself when the end of the 1950’s brought about the demolition of The Colonel Vernon. 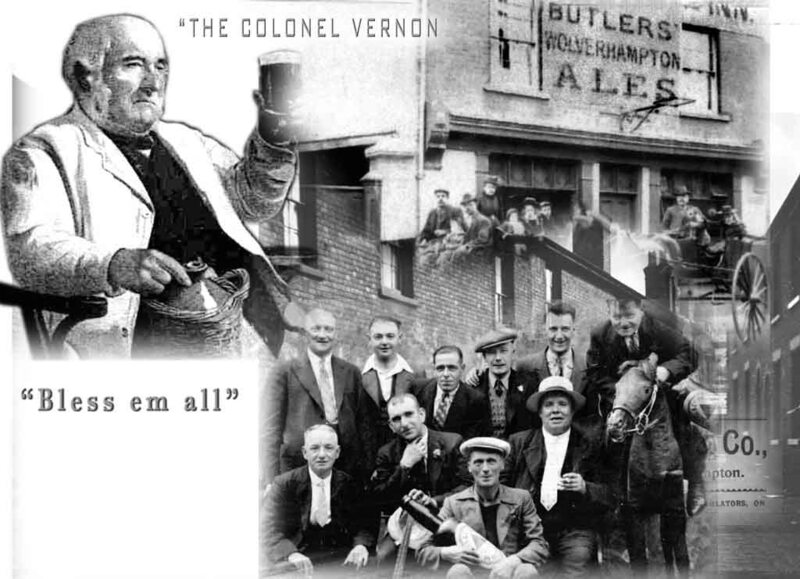 It had served the local residents with Butlers Beer for as long as anyone could remember The licensee on its demise being Ted Adey. Ted arrived at the “Colonel” in 1912 from the Duke of York, in Little Brickkiln Street.and stayed there for the remainder of its forty four year life. The Colonel Vernon was typical of the small town local’s of the day, with two public rooms either side a central passage. For awhile in the years just after the War each Sunday lunchtime I would call and fetch my fathers regular pint of beer, in the old whisky bottle; he kept for such an occasion. You entered the passage from North Street, and on your left was the small Snug or parlour , which at 1 o’clock you would see seated a few chaps reading the Sunday papers and the same couple of old biddy’s with their milk stout or half of mild enjoying a little respite. Opposite across the passage was the bar which would be filled to capacity with men enjoying a pint before their Sunday dinner. The hatch to the outdoor servery was a little further along the passage from the bar entrance and was serviced by who ever was behind the bar at that time. At the end of the passage during the 1930’s my aunt recalls the Adey’s having a parrot hanging on a perch he used to say,” Yow ‘ere agin?” or “Gon’ a’ one Ted”; he was a great attraction for those waiting at the outdoor. When it came my turn Mr or Mrs Adey would take my bottle fill it with the aid of a tundish from the tap, and seal the top with a sticky label (A lawful measure required to serve some one underage). But like any curious kid of the day, I always had a little taste on my way home. Ted Adey had this little game he used to play with us youngsters visiting the pub. On a hook hanging beneath the bar counter he had a bunch of picture cards, he would look at the card, and then at you, and mutter something which always seemed to get a laugh from those alongside you at the time. Later I found out why this was a source of regular amusement. 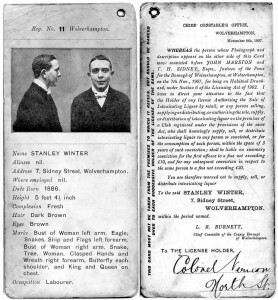 You see a general practice at the time that Ted took over the Colonel was that a check was kept on habitual drunkards, each public house was circulated with a separate card relating to each offender, this card largely resembled a passport. 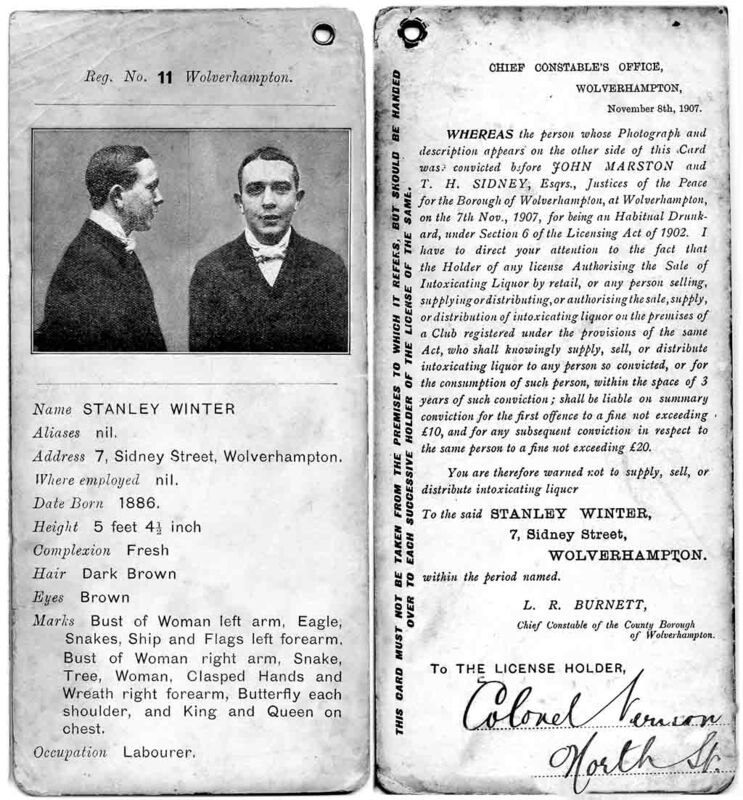 At the top were two photos of the offender – One taken full face and the other the profile – Below was the name, address, and occupation, plus, a full description and any distinguishing marks. Of course this included both sexes. Even though were armed with these documents – the bartenders still had to keep a sharp eye open, as there was a heavy penalty for serving anyone, (men or women) so blacklisted, with intoxicating liquor. Re the photo “Ted Adey …. with his wife Ethel and their two children at the Colonel”: Based on the fact that the son looks younger than the daughter I’m not sure that the photo is indeed what it says. (Edward) Adey married twice. He and his first wife Florence had had 2 children by the time of the 1911 Census (when they were living at the Duke of York) – Thomas Edward aged 6 and Florence May aged 2. 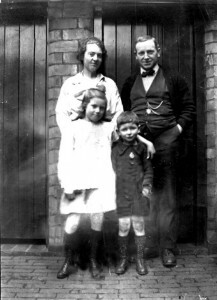 A third child – Nancy – was born in March 1913, and 28 year-old Florence died soon after in 2q1913. Edward married spinster Ethel May Holmes in 4q1919. I haven’t found any Adey/Holmes children. So – ?? ?.